If there is one thing no one understands about Game of Thrones, it's the enigma of Bran Stark. The young man has completely changed from the carefree child he started out as in the very first episode, and is now the impassive Three-Eyed Raven. He seems to see all, hear all, and know all - except how to blend in enough that he doesn't completely freak out his siblings. Nonetheless, one of Bran's most well-honed abilities is "warging" into various creatures, which basically means his conscious takes over their able bodies. We've seen him doing it multiple times throughout the series, and lately, his animal of choice is the raven. Ravens make it easier to fly long distances and see what the Night King is up to. But it seems like he might be using his ability to spy on more than just the Night King! Redditor massattack75 points out that in the premiere episode of season eight, there's a raven lurking in the background as Sansa and Tyrion reminisce over their annulled marriage and individual journeys over time. When Sansa walks away, Tyrion looks out into the courtyard, catching the eye of Bran, who is staring directly at him. He looks as if he's heard every word of their conversation (and agrees with his older sister, as well). Since ravens are the main method of communication in Westeros, it would be incredibly easy for Bran to use them to listen in on conversations. They're literally always around, so no one would suspect a thing. It also explains how he seems to always know what's going on, though his other abilities probably help with that as well. Another Redditor even proposed that Bran may have warged into Daenerys's dragon, Drogon, during her ride with Jon. It would definitely explain why the dragon was staring at the two so intently, especially when they began their intimate embrace. Even Jon noticed the dragon's stare (as did viewers), which could definitely be interpreted as a warning glare. And what did Bran do as soon as Jon was free after said ride? Command Sam to tell Jon the truth of his birth! He was trying to save his brother cousin from doing anything more until he knew the truth. 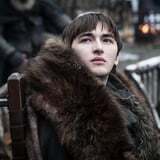 When you put it all together, it definitely seems like Bran as been playing Peeping Tom with the folks of Winterfell, especially his family. It's a smart - but seriously invasive - move that could probably end up saving their lives. As we saw in the first episode, Bran isn't trying to waste any time on false pleasantries and silly drama - he's here to make sure the living win the war against the dead!